Posted in: Uncategorized. Tagged: district data labs, Mandi Traud, social media, Social Media Mining, social scientific research. Nathan and I are excited to be working with both Mandi Traud and District Data Labs in bring together a workshop on some of the core topics of our book. With their help, we have made some important additions including Topic Modeling and Network Analysis, while keeping the principles of sound social scientific research and sentiment analysis using Lexicons, Supervised Learning, and Item-Response Theory. The below materials are for the workshop, Analyzing Social Media Data with R, on Saturday January 24th. We are proud to make them available for the class and for a short time, a wider audience. We (Mandi, Nathan, and I) just wanted to address a few things to ensure that students of the upcoming class are adequately prepared for the workshop and that we make the most of the time we have together. Download course materials are available by request. Come prepared with questions or problems that are important to you! *If you are a faculty member interested in this content for educational purposes, and the link is no longer active please contact us and we will be happy to assist you. Readers may be pleased to know that Nathan Danneman and Richard Heimann have teamed up with Packt Publishing to organize a giveaway of their new book, Social Media Mining with R.
Over the new two weeks five lucky winners stand a chance to win a digital copy of the book. Please keep reading to find out how you can be one of the winners, more about Social Media Mining with R.
Social Media Mining with R is a concise, hands-on guide with many practical examples of mining social media data and a detailed treatise on inference and social science research that will help you in mining data in the real world. Whether you are an undergraduate who wishes to get hands-on experience working with social data from the Web, a practitioner wishing to expand your competencies and learn unsupervised sentiment analysis, or you are simply interested in social data analysis, this book will prove to be an essential asset. No previous experience with R or statistics is required, though having knowledge of both will enrich your experience. All you need to do is (1) read over the material above or head on over to the book page and look through the product description and then (2) share, via Twitter (mention @rheimann and/or @ndanneman) your favorite efforts in social media mining or more broadly in text analysis and natural language processing. This can be a picture of some analytical output, an academic paper, a Twitter handle of someone doing novel work in this space or even a commercial or open source tool, programming package, or programming library that you find to be useful! In this way, there are no losers as we will all learn. The contest requires less than 140 characters of work on your part. We will tweet the winners in two weeks and only require a valid email, not to be used for any other purpose than sharing directly the eBook information. We hope to hear from you soon! As always, you can find us on Twitter @rheimann and/or @ndanneman. Social Media Mining with R has had a fantastic first month. So far, we’ve received good feedback from technical editors, invited reviewers, and the general public. We’ve also been able to successfully field queries from users, who, fortunately, have had very few technical issues to report (and no systematic ones). Additionally, we’ve been flattered by peers and colleagues reaching out to us, expressing their interest in using the book as part of syllabi for courses in marketing, communications, and sociology departments. We look forward to hearing back from these instructors on how we can improve the book, and possibly provide additional supporting materials. Book Release Announcement and Special Offer by Packt – BOGO!!! We are proud to announce the forthcoming release of our first book. We were first approached by Packt Publishing in June 2013 to write on a topic of our choosing that related deeply to social media and data mining. We turned down the offer due to an already busy work schedule and an initial expectation on the part of Packt to complete the material in 60 days. The offer was interesting however and we speculated about the content and direction of a book in a world where we had the time to take on such a task. When Packt revisited the idea in July with a revised timeline we accepted, knowing in advance that the new timeline would still be challenging. We missed our target by three months, but we agree that the importance of the topic deserved the extra treatment and the resultant book reflects the extra months. The expected released date is March 24th 2014, by our publisher Packt, who is about to release their 2,000th book (https://www.packtpub.com/about-us). To celebrate their 2,000th book Packt is campaigning a promotion that happens to coincide with the release of our book, “Social Media Mining with R.” During this offer Packt is giving its readers a chance to dive into their comprehensive catalog and Buy One, Get One Free across their entire range of eBooks. The campaign begins on 18th-Mar-2014 and will continue up until 26th-Mar-2014. The book can easily be found on many of the common outlets and some are listed here for convenience. Social Media Mining with R exposes readers to techniques known commonly to extract sentiment from social media data by practitioners as well as less known nontrivial unsupervised sentiment analysis. These techniques are rather complex and at times counterintuitive and often assumption-laden. The authors provide readers with a how-to guide to implementing these models, and think it is critical to explain the techniques in depth, so users can deploy them appropriately and interpret the results. This book explains the theoretical grounds for the techniques developed and serves as a bridge between the discussion of the pitfalls of social media mining and the execution of that mining. Social Media Mining with R provides valid arguments for the value of data and from a social science perspective how to mine data from the web. Readers are not assumed to know R or statistical analysis but are pragmatically provided the tools required to execute sophisticated data mining techniques on data from the web. Social Media Mining with R begins by introducing the reader to the topic of social media data, including its sources and properties. The book then explains the basics of R programming in a straightforward, unassuming way. Thereafter, the authors make readers aware of the inferential dangers associated with social media data, and how to avoid them, before describing and implementing a suite of social media mining techniques. Readers will learn the basics of R, social media and data mining. If you have ever been interested in programming, social media, supervised or unsupervised learning, data science, or big data – particularly as it relates to finding value from data on the web than this book is for you. We are excited to share our experiences with you! 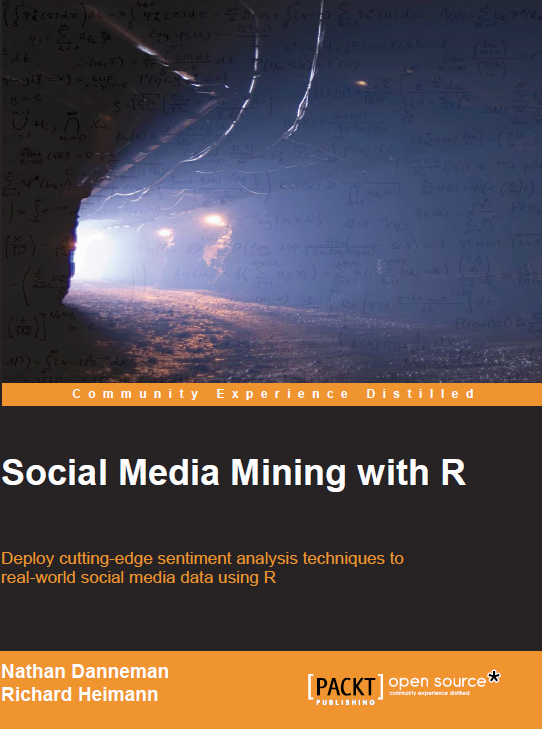 Overall, Social Media Mining in R provides a light theoretical background, comprehensive instruction, and state-of-the-art techniques, such that readers will be well equipped to embark on their own analyses of social media data. The basics of R and various data types. Data potential and pitfalls and inferential gotchas. Visualization and some cognitive pitfalls. Social Media Mining with R is intended for a wide audience, including the undergraduate who wishes to get hands on experience working with social data from the web to practitioners wishing to expand their competencies and learn unsupervised sentiment analysis. No previous experience with R or statistics is required though having knowledge of both will enrich your experience.